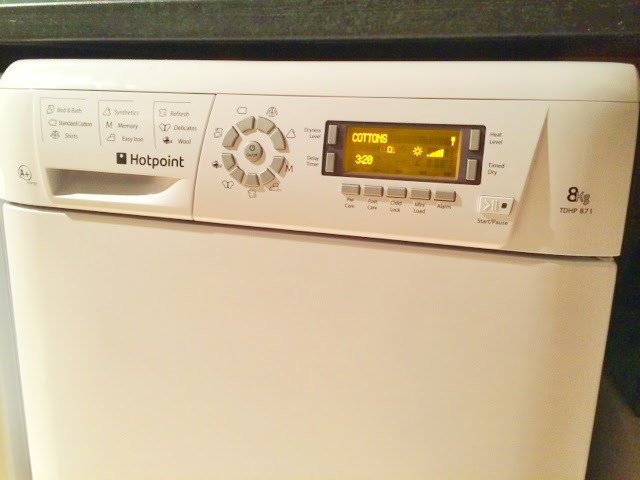 Last week I shared my review of the Hotpoint WMFUG742P washing machine with my readers. 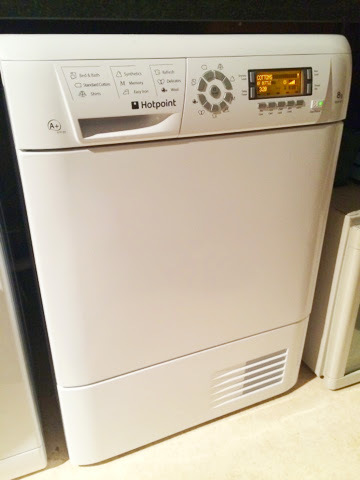 This week I'm lucky enough to be able to also review it's sister product - the Hotpoint TDHP 871 tumble drier. This is marketed as a condenser tumble drier, however when the drier is delivered it comes with the hoses and fixings for you to easily convert it to a draining tumble drier, if you have the plumbing set up in your home. The water container is easily pulled out from the top left of the drier and holds a generous amount of water, although it is recommended to empty this reservoir after every cycle to ensure the load is thoroughly dried. There are two filters that need to be regularly cleaned, the drum filter and the heat pump filter. Both are easily accessible and can be cleaned in seconds. This drier has an 8kg load capacity which is more than enough for a bedding set and a few towels! There are 9 drying programmes that you can select (including wool and delicates) and a further 7 drying levels, ranging from DAMP to EXTRA DRY. We have found that both the CUPBOARD DRY and EXTRA DRY leave cotton clothes quite creased, however there are lighter drying levels that give better results. As with the washing machine, drying times are constantly adjusted throughout the length of the cycle to give you the most economical performance. You can also set a timed dry, within a number of the programmes/materials. As with the Hotpoint washing machine you can set a timer delay for up to 24 hours on a number of the programmes to ensure your load is dried at a time that fits in with you and your family. To reduce creases there are Pre and Post care options that will gently tumble the load with cool air to keep clothes refreshed. There is the added benefit of a child lock, which will disable all other buttons when activated. The display is clear and easy to read, with reminders to empty the water reservoir and clean filters at the start of every cycle. It is obviously noticeable when the tumble drier is running but you can easily hold a conversation in the room and once you are in a different room, the noise is hardly noticeable at all. Since using this tumble drier we have had no issues at all with it, Clothes come out evenly dried, with no damage and often in less time that the standard cycle length. I would happily recommend this drier to people. however all words and opinions remain my own. I couldn't survive without my drier - especially in the winter.